Re-entry Permit: for lawful and conditional permanent residents traveling abroad to re-enter the country. Refugee Travel Document: for refugees or residents with asylum status traveling abroad to re-enter the country. Advanced Parole Document for Individuals Currently in the United States: advanced parole is permission for an immigrant to enter the United States for a specific purpose. A “paroled” individual remains an “applicant for admission” and they can continue filing for a different immigration status. Advanced Parole Document for Individuals Outside the United States: this rare measure is used to allow individuals to travel to the United States for a short time to seek parole, who in normal circumstances would be considered inadmissible. This is used in cases of urgent humanitarian need or for significant public benefit. You can download the PDF document from the USCIS website free of charge here. You can print it off, or you can type in your information into the PDF. *Note: if you are typing the information in the PDF file be sure not to alter the bottom of the page with notes, staples, spills or anything else after you’ve printed it out. The USCIS uses 2D barcode technology to read information that was typed into the application. Have a question about Form I-131? Ask it in the discussion board. + A biometrics services fee of $85 is required for applicants ages 14 through 79. A biometrics services fee of $85 is required for applicants ages 14 through 79. All fees are paid by check or money orders. They must be drawn from a financial institution that is located in the United States. It must be payable in U.S. dollars, and should be made to be payable to the U.S. Department of Homeland Security, written exactly like that. If you do not live inside the United States, contact the nearest U.S. Embassy or U.S. Consulate and they will give you instructions for payment. USCIS fees do change sometimes. You can check the updated amount here or call the USCIS National Customer Service Center at 1-800-375-5283. If you cannot pay the fee then check out the USCIS’ guide for Filing for a Fee Waiver. What evidence needs to be attached? 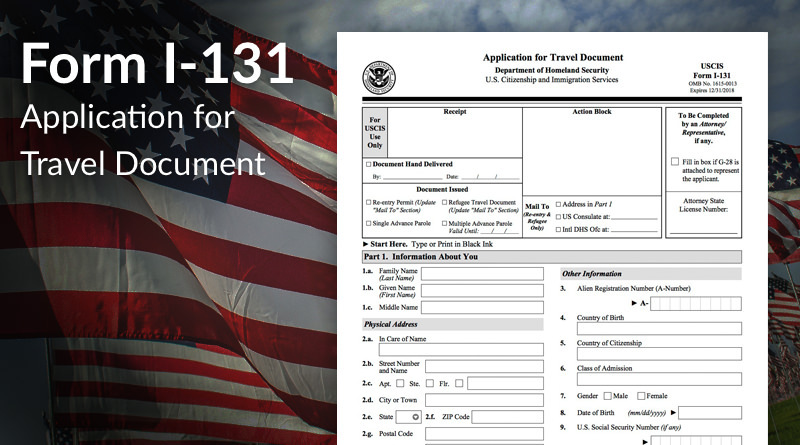 Each travel document requires different evidences to be submitted along with the Form I-131. However, each document does require a copy of an official photo identity document showing your photo, name, and date of birth. A copy of the Form I-797, Notice of Action, approval notice of an application for replacement of your Form I-551 or temporary evidence of lawful permanent resident status. For the Refugee Travel Document you just have to attach a copy of the document that proves your refugee or asylee status (with the the expiration date). This document was issued to you by the USCIS. The requirements for the Advance Parole Document for Individuals Who Are Currently in the United States are a lot more extensive. Here they are according to USCIS. A copy of any document issued to you by USCIS showing your present status, if any, in the United States. If USCIS has deferred action in your case under DACA, you must include a copy of the Form I-797, Notice of Action, showing that the decision on your Form I-821D was to defer action in your case. If ICE deferred action in your case under DACA, submit a copy of the approval order, notice or letter issued by ICE. You must complete Part 4. of the form indicating how your intended travel fits within 1 of the 3 purposes below. You must also provide evidence of your reason for travel outside of the United States including the dates of travel and the expected duration outside the United States. If your advance parole application is approved, the validity dates of your Advance Parole Document will be for the duration of the documented need for travel. (b) A document showing enrollment in an educational program requiring travel. A letter from your employer or a conference host describing the need for the travel. For applications for an Advance Parole Document for an Individual Who is Outside the United States there are different evidences required depending on if you are applying under a Family Reunification Parole policy there are different evidence requirements. Applications independent of a Family Reunification Parole policy have different requirements as well. Both the Refugee Travel Document and Advance Parole Documents need passport-style photos attached to the application. Where do you send the Form I-131? Jidy is a BYU student from Washington interested in social issues, business, and tech. His father, who is from Laos, became a citizen a few years before he was born. Jidy enjoys traveling and studying social issues. He is currently starting an organization to address educational deficiencies in Uganda.